It was three thunderclaps from lightning, and all was eerily still on the lane. In Badgers garden, where the Mystical Mutt had been practising his latest spectacular bowls of toast trick, nothing moved. Further along the lane, Pogo Paws and Pickle, the new joint leaders of the gang, were having a blazing row. A travelling circus had arrived in town and Pickle was not happy.A Big Top has arrived on the lane with a spectacular attraction: a real live minotaur! But the minotaur wants to return home, and Pogo Paws is homesick for his childhood circus family. 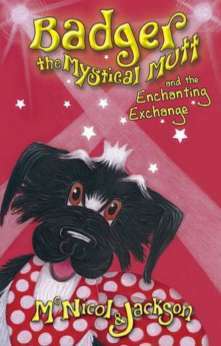 The minotaurs labyrinth is in a parallel universe called Esterious, and Pogo Paws circus is far, far away, and to return would mean abandoning Pickle.Can Badger, with his makeshift magic and a little help from a solar eclipse, open the portal in the Crystal Cave, and make the Enchanting Exchange happen? Or will Pickle sabotage Badgers attempts, and make it impossible for Pogo Paws and the minotaur to ever find their way home?